As U.S.-China competition intensifies, how should Washington realign its interests in the Middle East? The idea of disengaging from the Middle East (and Europe) to refocus attention on the Asia Pacific is not new. The Obama administration sought to do just this with its “Asian Pivot,” although events in Syria and the need to negotiate and maintain the Joint Comprehensive Plan of Action (JCPOA) prevented the policy from reaching culmination. Similarly, the decision to leave the INF Treaty indicates a strong desire to reorient security policy away from the Atlantic and towards the Pacific. That decision has almost nothing to do with Russia, and everything to do with the growing military threat posed by China. At his blog Scholars Stage, Tanner Greer has made a particularly eloquent case for shifting U.S. attention away from the Middle East. Greer argues that the Khashoggi murder offers an opportunity for the United States to disengage with Saudi Arabia and, more broadly, the management of security politics in the Middle East. Greer suggests that such disengagement is a necessary step towards redirecting U.S. attention towards the Asia Pacific, and in particular towards the looming confrontation with China. As Greer points out, China is already a more significant economic competitor to the United States than Kaiserine Germany, Nazi Germany, Imperial Japan, or the Soviet Union, and that as such the competition will demand the utmost American effort. Greer’s points are well taken, and undoubtedly many in the DC policy orbit have grown increasingly skeptical of the level of U.S. engagement with Saudi Arabia in particular and the Middle East more generally. That the United States has overcommitted to managing Middle East security since the 1991 Gulf War seems obviously true. However, the to the extent that the growing power of China makes disengagement from Saudi Arabia appealing, it also probably makes a broader policy of disengagement impossible. If we begin with the idea that China is a more substantial potential threat than the Soviet Union or Kaiserine Germany, then it is difficult to imagine that the United States will view competition with China in anything less than global terms. Within five years of the end of World War II, the United States embarked (to some extent accidentally) on what amounted to a global competition with the Soviet Union. Although the X Article and even NSC-68 (together, the founding documents of “containment” and U.S. Cold War strategy) called for measured, discriminatory responses to Soviet maneuvers, in short order the demand for a competitive strategy made it impossible in political and bureaucratic terms to resist entanglement across the globe. Not only did the United States soon find itself at war in Korea, but it also quickly developed a system of alliances that spanned the globe. Global containment of the Soviet Union made entanglement everywhere a bureaucratic and political necessity; it became difficult to say “no” to a prospective ally, no matter how appalling. And this was to contain a foe that was, in economic terms, far less formidable than the People’s Republic of China. In sum, it would be great if the United States could disentangle itself from the Middle East, both from the perspective of competition with China and because U.S. values are incompatible with those of Saudi Arabia. 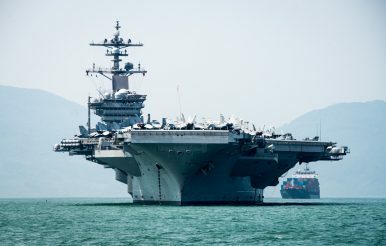 But if the United States decides to commit itself to competition with China in the Western Pacific, it won’t be able to keep that competition contained. Instead of “we must abandon Saudi Arabia to focus on China,” the claim will become “we cannot abandon Saudi Arabia because we are focused on China.” True or not, such an argument may well have the rhetorical power to keep the U.S. relationship with Riyadh in its comfortable groove. India-US-China: Aligning Interests or Managing Threats? India’s pursuit of its national interests will be tested by how it manages its relationships with the U.S. and China.